Awkward, this went so fast and random that I barely remember anything. One moment I'm vectoring Vin Diesel on bicycle and next moment I got this, I don't even. No idea why but autocomplete for tags didn't worked during submitting. Probably will be able to add them afterwards through. Browse BLOOD-C Gallery: Recent | Popular. I like the combination of red and black here that you used for the wall and the design for the background is nice, it looks awesome and fits Saya very well. I think Saya is vectored nicely. It's almost like maybe the black represents the humans and the red represent the furukimono she's fighting or vice versa and Saya herself is in the middle, wanting to be human but she doesn't really belong completely to one side. I also like the little flowers on the bottom left in the background. But I think the red squiggly lines look...I don't know how to put it...um, out of place maybe? Now the blood splatters themselves; like the ones on Saya's face, arm and hand are fine and they work with Saya since it gives off the feeling like she just got through killing something. And there was a HUGE amount of blood both in the anime and the movie so I am glad you didn't go for blood overkill. But the squiggly lines, at least for me look weird/distracting, so I like the alternative version without them. Though I think at least for the alternative version it would look better if you went in and added a few small blood splatters in different spots on her uniform and on her legs as well. 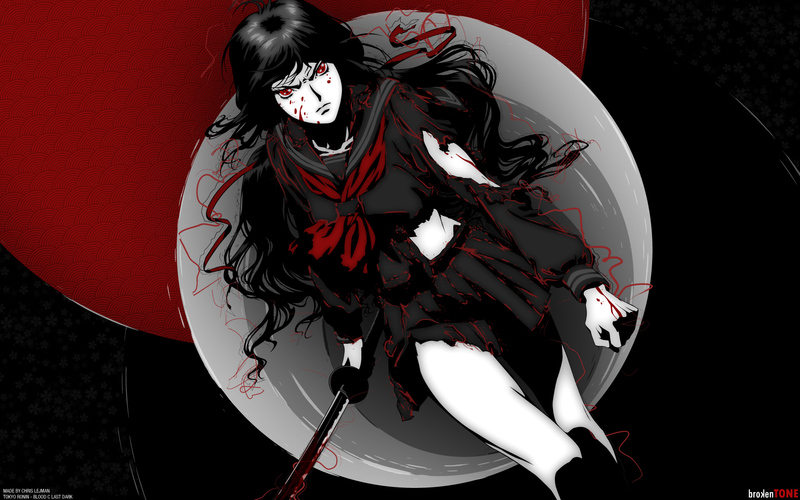 That said, another thing I really like is the deeper bit of red color you put into the bow of Saya's uniform. Saya's hair also looks really smooth, very pretty. I love the colours. Black, grey, white, red. Love the detail. And the nice big resolutions. But as Misa-san said, the red squiggly lines look weird. Like just random squiggles. And in the background where the red and black meet, on the left of the edge of the circle, that bit of white looks like you forgot to colour it or something. it's sad how the fanart is better than the anime, and your work is no exception. I rather like the detail to Saya and the blood splatter, sometimes some people go a tiny bit too wild, even the anime itself, glad you kept it tasteful and enjoyable. Awesome anime and movie, i still haven't seen the movie for this Blood-C but i have seen the old on either way awesome wallpaper. I love Blood-C ...and I really like this wallpaper .